Therapies to meet your needs – how to choose! Therapies tailored for you – what happens next? In 2002 he relocated to the United Kingdom where he has worked extensively in further and higher education, and is currently an external quality reviewer for a leading UK awarding body. Internationally, he has presented his work on teaching and learning practices, reasoning development, feedback and assessment, sports rehabilitation and sport psychology at major conferences, conventions and workshops. He has extensive experience as a mentor and has developed mentorship programmes internationally. Earle has been instrumental in designing therapy programmes that promote reasoning and graduate skills employability. He currently chairs The International Society for the Scholarship of Teaching and Learning (ISSOTL): www.issotl.org/interest_groups_affiliates.html He is a fellow of the Royal Society of Medicine: www.rsm.ac.uk, a graduate member of the British Psychological Society: www.bps.org.uk, a member of the British Association of Sport and Exercise Sciences (BASES): www.bases.org.uk, served as student liaison officer for the British Association of Sports Rehabilitators and Trainers (BASRaT): www.basrat.org and recently received the honour and status of senior practitioner in sports therapy with the British Register of Complementary Practitioners (BRCP): www.i-c-m.org.uk/about/brcp. Earle is an internationally acclaimed presenter, sought after to deliver seminars and workshops. Earle has worked with partner consultancies to develop best practices and is involved in developing professional and student experiences through active engagement with industry and commercial events. 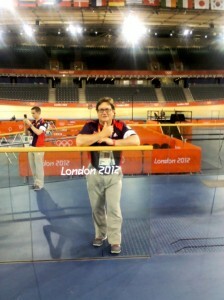 During 2012 Earle gave his services to LOCOG as an accredited sports massage therapist. Running support massage teams, he was situated in The Velodrome during The Olympics and in The Athletes Village during The Paralamypics. Earle is an MTI (Massage Training Institute) accredited tutor, and was recently appointed to the CNHC PSB. In his spare time Earle enjoys playing cricket & tennis and currently resides in Hertfordshire, UK. All first-time clients are offered a free 30-minute consultation immediately prior to the first session. Don’t you just love The Olympics?